Our guests can further personalize their visit to The Swag by adding one or more of our promotional packages to their stay. These special touches create memories to keep near your heart long after you have ventured down the mountain and back into the real world. Whether you’re planning your honeymoon, an anniversary surprise, a romantic escape, or an intimate wedding or elopement, our romance packages will warm your heart. Call us in advance of your visit to reserve one of our romantic extras. Make the most of your mountaintop getaway, explore attractions or enjoy an activity. We are happy to help you plan the perfect vacation and have created a few packages to chose from to make your trip one of the best experiences to remember. Call (828) 926-0430 or (800) 789-7672 to discuss booking your room or adding any packages you’d like to add to your reservation. Our local massage therapists will relieve tired bodies and and aching feet. Call the inn to book ahead prior to your stay. Order this natural stone vase and fresh cut flowers to your room prior to your stay and then take it home with you to have a special keepsake to remind you of your visit. A famous decadent treat is beloved by guests. One taste and you’ll see why this is listed as an amenity. A Swag bar is included with your lunch. If you’d like to take some extras home with you, we’re happy to help. Call (828) 926-0430 to purchase. Request any of these snacks and treats after a hike or before dinner. Just order as you wish prior to your stay or while you are at the Inn. Call (828) 926-0430 to add to your stay. Are you a lover of art and enjoy meeting the artists? Consider going on an Art Tour with Sherry Masters…see what a tour is like, and hear from some past participants on this video. The tour offers “..a connection between a person who likes art and crafts, but really needs to be connected to these artisans.” Deener Matthews, Owner of The Swag. This is a great opportunity to be introduced to local artisans and visit their local galleries and studios. The Biltmore Estate is within an easy drive of The Swag and should not be missed if you are visiting the area. This private estate built between 1889 and 1895 is one of the largest privately owned homes in the United States. Built during the Gilded Era as a summer estate for George Washington Vanderbilt II, this home is still in the Vanderbilt family. While staying at The Swag enjoy this two day ticket to fully enjoy the estate and gardens. Available on September 13th and 27th, 2018, this rare package gives guests the opportunity to observe elk during their most active time of the year. Each fall the call of the wild can be heard in North Carolina’s Cataloochee Valley when the elk enter rutting season. This is an active time of the year when the male bulls engage in a piercing sound called bugling and enter into antler wrestling matches with other males. For those lucky enough to witness this fall ritual, it is a sight and sound to behold. Esther Blakely, master naturalist and elk expert will lead the tour and provide information on the area’s rich history, wildlife and the reintroduction of elk in 2001. Available twice this fall, September 13th and 27th, 2018, the two night package, which needs to overlap the 13th or 27th, 2018, is priced for two people. 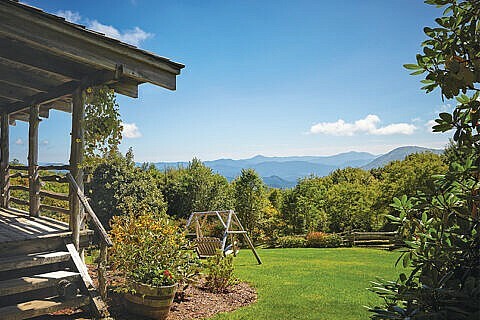 The package features the four-hour sunset journey to Cataloochee Valley, luxury accommodations, all meals, including a snack and beverage for the four-hour tour followed by a dinner basket upon your return. The package starts at $1280 per room plus tax and service charge. Additional guests can be added for an extra fee. The “Sunset Elk Experience” package is limited to 4 people per day available. Please call The Swag directly at 800-789-7672 to make your reservation for the “Sunset Elk Experience” package.